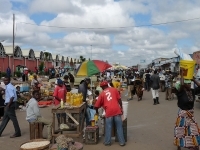 The vibrant capital of Zambia, Lusaka is home to roughly a 10th of the country's population. The city is an interesting mixture of modern and traditional, with new high-rise buildings towering over colourful outdoor markets. Lusaka is home to a number of sights and attractions, including museums like the Lusaka National Museum, the Political Museum and the Zintu Community Museum; monuments and statues dedicated to freedom fighters; and cultural attractions like a theatre, cinema, zoo, golf club and the Munda Wanga Environmental Park. Lusaka is the best shopping destination in Zambia, with traditional goods and handcrafted souvenirs on sale next to Western shops like Woolworth's and Shoprite. There are a variety of restaurants ranging from pizza and sandwich shops to Korean barbecue and Pakistani kormas, and enough bars and clubs to keep both locals and visitors entertained. Centrally located, Lusaka is within driving distance of many of Zambia's game parks, including South Luangwa National Park and Kafue National Park. Blue Lagoon is a popular excursion for viewing game like zebra, buffalo and hippos. Lusaka can be quite an overwhelming city, sprawling and chaotic, and foreigners do need to be vigilant and protect themselves against crime; however, the Zambian people tend to be very friendly. Lusaka is not really a prime tourist destination, but many travellers do find it necessary to travel through the city, and those that do spend time in Zambia's capital should find plenty to keep them entertained.